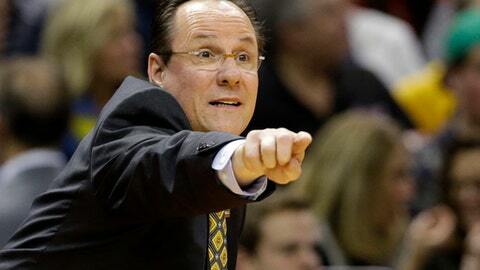 WICHITA, Kan. (AP) Wichita State coach Gregg Marshall got the upgrade he wanted without any drawbacks. Rumored for years for every big-time opening in college hoops, Marshall has always insisted he is happy with the Shockers. But he also had made it clear that he wasn’t happy with the way his program was slighted in March, perhaps because of its membership in the Missouri Valley. Well, that changed with the Shockers’ move to the American Athletic Conference this season. The Shockers have traded out games against the likes of Southern Illinois and Indiana State for higher-profile matchups with Cincinnati and UConn, and the upgrade in schedule strength should no doubt help when the NCAA Tournament selection committee gets to work later this season. Getting into the tournament has never been a problem, though. The real issue has been the fact that the Shockers have been under-seeded. They were a 10-seed last season despite winning 30 regular-season games, and even the year they went unbeaten and earned a No. 1 seed, they were bracketed along with an eighth-seeded Kentucky team filled to the brim with NBA lottery picks. The year the Shockers went to the Final Four, they had to upset their way there as a No. 9 seed. It helps that the Shockers return their entire starting five from last season. That glut of talent, led by the duo of Landry Shamet and Markis McDuffie, is a big reason why the coaches in their new league picked them to finish second behind the Bearcats this season. Shamet had foot surgery in July and McDuffie is recovering from a stress fracture in his foot, and both could be out until December. But if their top two scorers last season return close to 100 percent, that should give the Shockers their full contingent for the start of league play. Sure, the AAC will be a test. But the Shockers are in the Maui Invitational with the likes of California, Marquette, Notre Dame and Michigan, then visit Baylor and Oklahoma State before a home game against Oklahoma. They also play perennial NCAA Tournament darling Florida Gulf Coast. Along with Shamet and McDuffie, both juniors, the Shockers return seniors Shaq Morris, Darral Willis, Zach Brown and Rashard Kelly. All of them played at least 40 percent of the team’s minutes last season, giving them veteran depth. The Shockers signed 7-foot Danish center Asbjorn Midtgaard, though he’s raw enough that a redshirt is an option. They also brought in high-scoring junior college guard Samaje Haynes-Jones and Rod Brown, a springy forward from Tennessee who graduated from high school a year early. Marshall said one of the benefits of the new league is recruiting. Trips to talent hotbeds such as Texas and Florida open up new options for the Shockers.